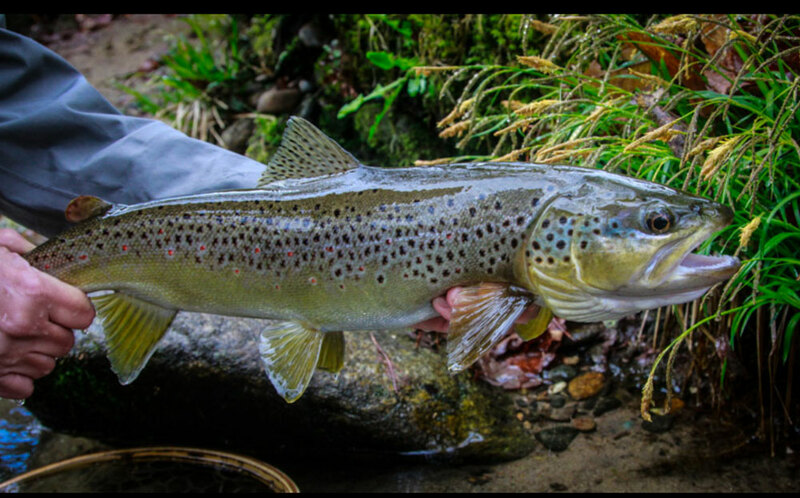 Fishermen aren’t likely to hook into as many trout during the winter, but fishing slowly, covering water thoroughly, and using the right nymphs, might get you a hookup with an extra-big brown trout like this one. Bigger streams like South Carolna’s Eastatoee River, a delayed-harvest stream, tend to fish better in the winter than smaller, more remote waters. 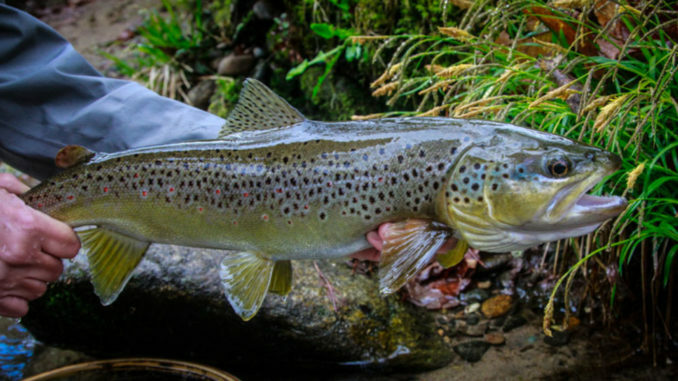 Whatever the weather brings, one thing is certain: trout streams will be waiting, and the fishing will be good as always — depending on your definition of good. Trout must eat regardless of the weather, and true trout fishers must fish regardless of the weather. Fishing techniques should adapt to the weather and the fish. 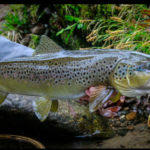 Trout are less likely to move when the water temperature is 40 degrees or lower, so feeding lanes will be much narrower. The amount of time fishing one spot should be doubled, even tripled. Fish an area thoroughly, move a few feet and continue casting, using the roll cast when appropriate. Nymph fishing requires a slow presentation that concentrates on slower water in the deeper sections of a pool or run. 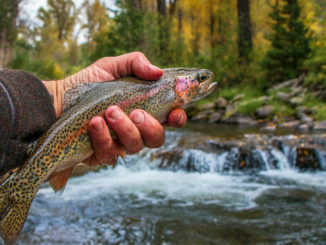 To increase your chances of getting a strike, use a dry fly such as a Royal Wulff as a strike indicator and tip your nymph dropper with lead or use a bead-head nymph. When using lead, crimp the lead close to the fly. The nymph should be small enough that it doesn’t drag the dry fly down. For Nos. 16 to 14 nymphs, for example, use a No. 12 or larger dry fly as the indicator, attaching the line to the shank of the nymph so that the dropper dangles about a foot below the top fly — depending on water level. Work upstream and let the nymph dead-drift to the bottom of a pool or run, stripping it in short spurts. If you see a trout following the fly but not taking it, freeze — and give the line a short jerk. That will make the trout think the nymph is trying to escape, and it will usually strike. Strikes often will be subtle, sometimes little more than a slight hesitation of the line. Use a variety of sizes. If a large nymph such as a No. 10, No. 8 or a No. 6, doesn’t work, switch to a No. 20 or No. 18. Cast large nymphs such as Woolly Buggers across the current. When the line straightens, lower the rod tip, and work the nymph through the water in short strips, keeping the rod tip down so that the nymph stays deep. 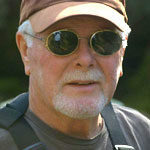 Often, a trout won’t hit on the first couple of casts, so continue casting. Keep your presentation slow to give the trout more time to study the fly. Sometimes you must put the fly in the trout’s face to get a hit. In the winter, dark colors — browns, blacks and olives — work better than bright colors. Suggested patterns are Nos. 24-20 Zebra Midge, Nos. 16-14 Griffith’s Gnat and Nos. 14-12 black Winter Stone. Large sculpin patterns in Nos. 8-4 are very effective in big-water streams as are large black, brown or olive Woolly Buggers. Not all winter fishing is limited to nymphs. Warm, sunny, winter days can produce small but productive hatches of midges and, periodically, Blue-Winged Olives, which can be found on mountain streams almost any time of the year. Winter fishing often can be frustrating because trout will suddenly turn off, and nothing you throw to them will get a strike. Weather, more than anything else, dictates the quality of fishing, and the time of day when you’re fishing is often more important than the pattern you use. Once the sun dips below the treetops, water temperatures drop quickly, and trout hunker in to wait out the cold. 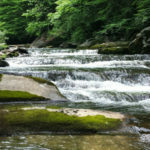 Larger streams, such as the Oconaluftee River on the Cherokee Indian Reservation and the larger delayed-harvest streams such as the Nantahala and Tuckasegee, rivers in North Carolina and the Chattooga River and Eastatoee rivers in South Carolina offer excellent fishing in the winter. 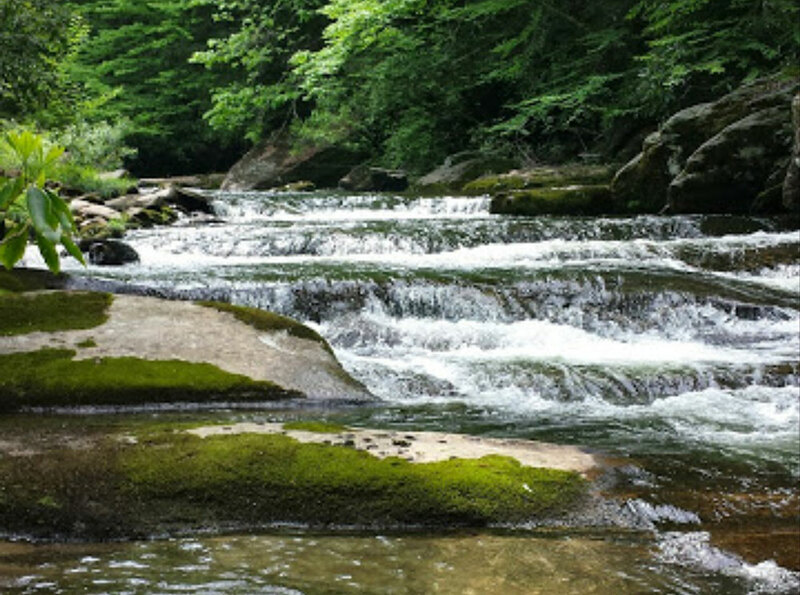 The Oconaluftee is stocked weekly during the winter. South Carolina’s delayed-harvest season runs from Nov. 1 through May 14. The delayed-harvest season in North Carolina is Oct. 1 through May 31. All delayed-harvest waters in the mountain region were heavily stocked during the fall, so fishing should be excellent throughout the winter.